There are two main screens in CalZones, which you can toggle back and forth with a button in the right corner of the bottom toolbar. The first view is a horizontally scrollable, color-coded comparison of time across time zones you've set up in the app's settings. The grid lets you quickly see what the current time corresponds to in a different city, but it's also useful should you need to plan ahead for a future event and relative times around the world. As you scroll and advance the grid, you'll notice that work hours (also to be configured in settings) are colored differently from off-work and nighttime hours; different themes have different shades and colors, but the idea stays true whether you use the default theme, dark mode, or other color schemes. Some of the theme options available in CalZones. While I found the basic grid useful thanks to its thoughtful use of colors to indicate active hours, it's the integration of calendar events that puts it above other calendar or time zone utilities for me. 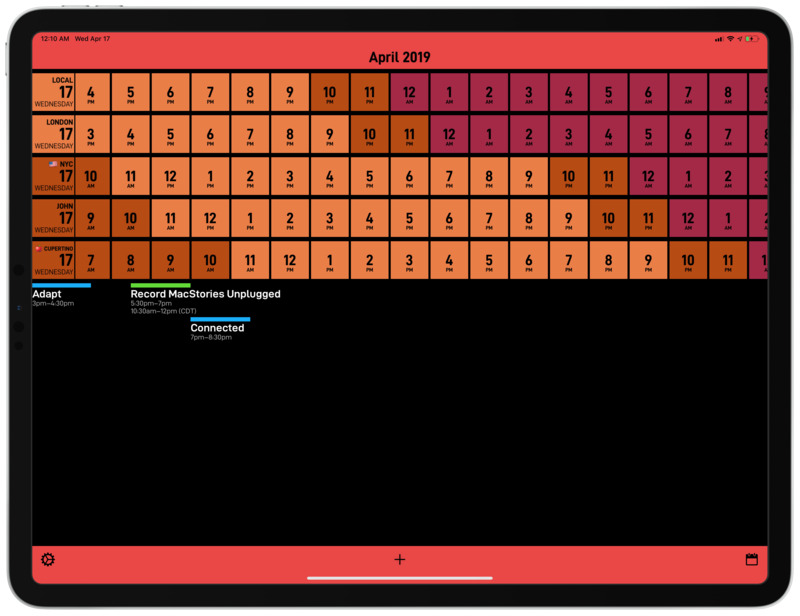 At the bottom of the grid, you'll find events that start at the hour displayed in the grid above; a colored strip above the event's title acts as a duration bar as well as a visual indicator of the calendar the event belongs to (you can configure calendars in the app's settings). One of my favorite details about CalZones is how it displays multiple time zones in this view: in my case, events created by John in an iCloud calendar we share will feature both my local time zone and John's (CDT). This option is made possible by a helpful option in CalZones' settings that lets you choose to display both time zones if different, the original event time zone only, or always your local time zone. The ability to quickly reference them both at a glance allows me to text John and say "remember we have a call at your noon/my 7 PM" without having to do any of this math in my head. 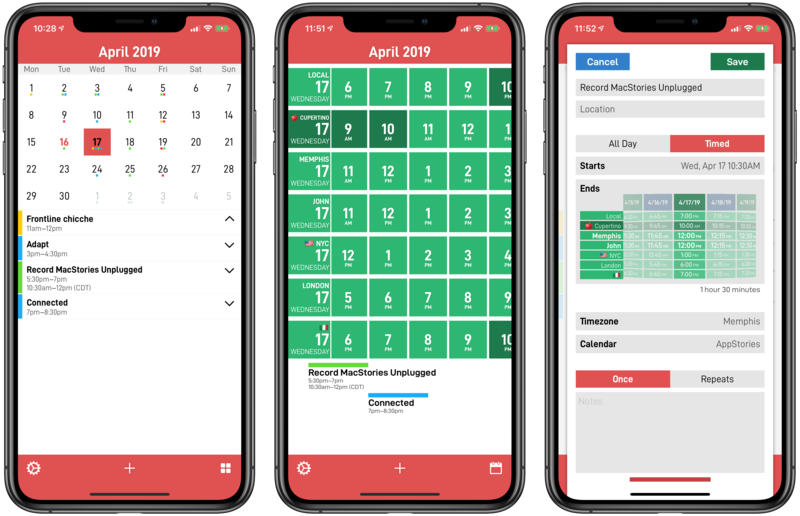 The second view in CalZones is a traditional monthly calendar that, however, has also been enhanced with special time zone-related functionality. As with other calendar apps, each day on the calendar contains colored dots if events are scheduled to start on that date. Events appear at the bottom of the calendar, but there's a twist: each event can be expanded to reveal the respective start and end times in other time zones, which are the ones you can configure in CalZones' settings. Time zones are presented with both times and their codes (GMT, EDT, PDT, etc. ), which is a nice touch. CalZones' blend of calendar and time zones doesn't stop at visualizing events though. You can also create events directly from CalZones; doing so, of course, differs from your standard calendar client because of how Smith chose to present time zones. CalZones' most innovative and useful feature is the following: when you're creating or modifying an event, the date picker for start/end times displays the time in all the time zones you've configured in the app, plus your local time. Swiping to scroll the time wheel in 15-minute increments automatically scrolls it across all time zones, giving you a fast, useful system for checking times from the event creation process itself. Smith's date picker is a genius idea, and it's a feature I've never seen done by any other app in my 10 years of reviewing iOS software. It's also the kind of feature that feels so obvious once you use it, you'll wonder why nobody thought of it before. Making instant time zone comparisons part of the event creation flow adds useful context for folks who work across time zones, and it reduces back and forth between event participants as it helps you get the times right for everybody on your first try. After using this date picker, I want it everywhere. 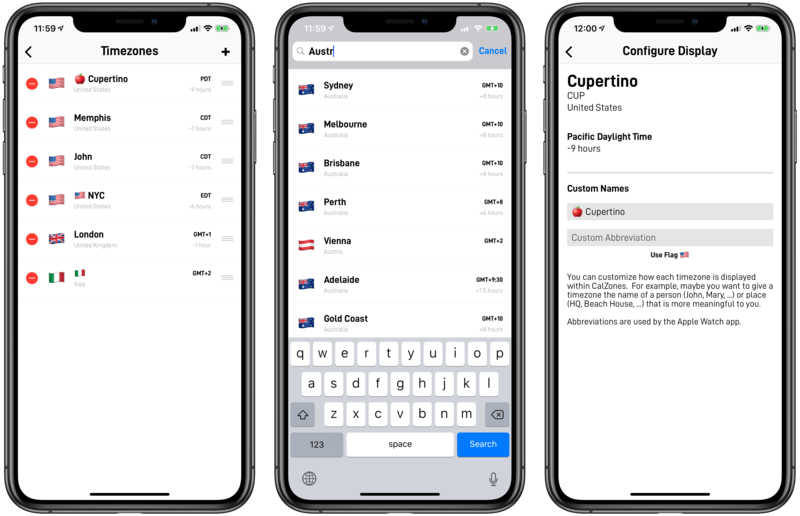 Time zones can be configured in CalZones' settings: to add a new one, just tap the '+' button and search for a city or country around the world. In search results, cities are displayed alongside the emoji of the country they belong to, country name, plus time zone codes and time difference relative to your current location. Once you've added time zones to the app, you can reorder them and inspect details about each individual time zone. This screen is where CalZones hides more useful functionality that lets you personalize the experience for both iOS and watchOS. Adding and customizing time zones. In the 'Configure Display' screen, in addition to learning about time zone codes and time offsets, you can assign a custom display name and custom abbreviation to a time zone. Abbreviations are used by the Watch app (which I'll cover in the next section), and CalZones offers a helpful 'Use Flag' button that lets you insert a time zone's relevant country flag with one tap (you can also enter a text abbreviation). Display names are used in the main iOS app and you can use whatever you want in this text field: personally, I prefer to mix and match emoji with custom text. For instance, my Chicago time zone is the U.S. flag followed by "John" (that's where he lives) while the Cupertino time zone is displayed as an apple emoji. It's a small touch perhaps, but the ability to customize how time zones are sorted and displayed feeds into the idea that CalZones is designed to help people who work across multiple time zones with remote teams every day. From that perspective, I would consider CalZones a professional tool rather than just a mere throwaway utility; and when it comes to pro apps that assist users in their work, personalization is often key to the experience. "My ideal customer is likely someone who has regular meetings/calls with colleagues spread out across the world", developer _David Smith told me in a recent conversation we had about CalZones. "A lot of the early design was based on feedback I got from Myke Hurley who, as the co-founder of a podcast network, is constantly coordinating recordings with a very international collection of co-hosts. I figured if it works for him, it will work for most people", Smith added. Indeed, the design and flexibility of CalZones – the fact that it can scale from two cities to a dozen time zones – means the app can be used to quickly convert between times as well as to manage an entire calendar full of events that involve other people around the world. Thanks to its personalization features, CalZones can appeal to all kinds of customers, especially those who, like Myke, have colleagues and clients living in several different time zones. 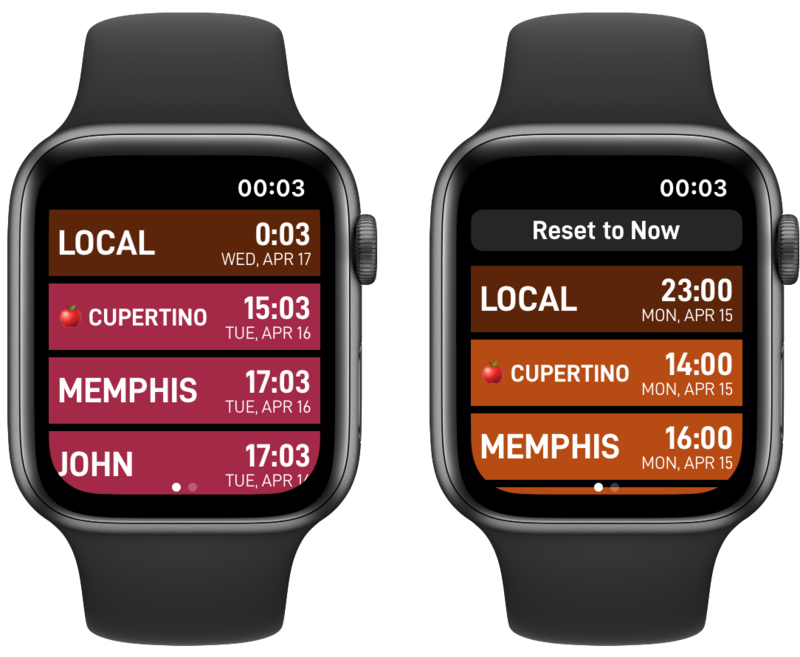 _David Smith is not new to Apple Watch app development (his previous apps Pedometer++ and Workouts++ are MacStories staff favorites), so it's no surprise that CalZones comes with excellent watchOS integration too. 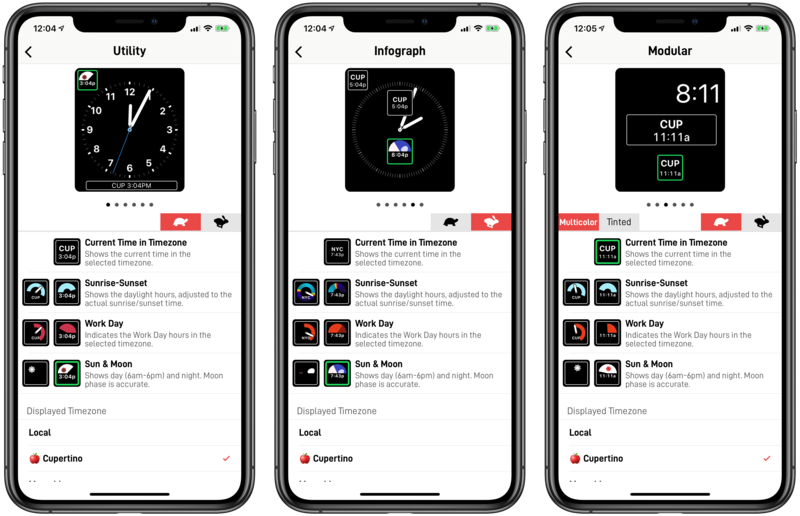 CalZones' Watch counterpart shares two common traits with my favorite watchOS apps: it can be fully configured from its iPhone app, and it comes with extensive support for complications. The CalZones Watch app is a simple list of time zones that you can scroll by swiping on-screen. The app uses the abbreviations you assigned in the iPhone app's settings. Spinning the Digital Crown allows you to modify the time shown in 1-hour increments (both in the past and future), which I've found to be a good way to quickly convert a future time between two different cities. Additionally, you can tap a time zone to enter a detail view that lets you create a new calendar event that uses the zone's current time as its start time. Both start and end times can be tweaked manually by swiping on an inline date picker and, in another nice touch, the 'Event Title' field comes with presets such as 'Meeting' or 'Call', but you can still dictate or scribble text if you want to use a custom title. 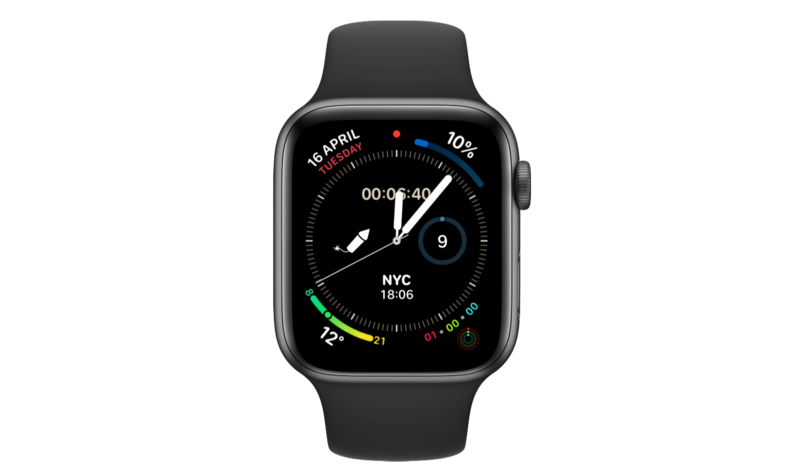 Despite the amount of functionality packed in CalZones' Watch app, I mostly rely on its complications for the Infograph face (I ended up going back to this one after testing the Siri face for about a month). Complications can be configured and previewed in CalZones for iPhone, which offers a (SpriteKit-powered) replica of the Utility, Simple, Modular, Extra Large, Infograph, and Infograph Modular watch faces that are animated in real time (and which also supports a "fast mode" to see how a complication changes throughout the day more quickly). My watch face, featuring NYC's time zone, powered by the CalZones complication. CalZones is a solid 1.0, and I think Smith did a good job in identifying a feature set that made sense for a first release and launching with it. That said, there are some features I would have liked to see today, and which I hope Smith will consider in future updates to the app. iCloud sync. Right now, CalZones does not sync your favorite time zones or preferences across devices with iCloud. It's probably a minor annoyance, but I didn't like having to recreate a handful of time zones (along with their order, custom names, and abbreviations) on my iPad Pro from scratch after I'd just configured them on the iPhone. A richer iPad layout. Speaking of the iPad, CalZones 1.0 is a blown-up version of the iPhone app that runs on the big screen. That's been fine for me because I tend to use CalZones in Slide Over, where the iPhone-like layout makes sense, but I have to wonder if a design specifically optimized for the iPad's larger screen could increase my usage of the app even further. I'm not sure how Smith could tackle this (perhaps there could be ways to embed both the calendar and time zone converter in a single screen? ), but I'd like to see something more than the iPhone app's layout on a 12.9" display. Siri shortcuts to invoke specific time zones. In its first release, CalZones does not offer any Siri shortcuts. There are two types of shortcuts I'd like to have in the app. First, there should be basic Siri shortcuts to quickly invoke a specific time zone from Siri and see/hear what the current time is in a specific time zone (so I don't have to deal with getting Siri's syntax right). Second, I'd like Smith to embrace the Shortcuts app with clipboard-based shortcuts that can convert time based on a string of text stored in the clipboard, which would allow users to build complex shortcuts that perform advanced time zone conversions without the need for a web API. A way to quickly copy converted time zones. CalZones lets you see what a specific time converts to in other time zones around the world, but if you want to get that information out of the app and, say, into an email or text conversation, you're out of luck. Whether with a separate 'Copy' button or via drag and drop (on iPad), I'd like to have a way to export converted times from CalZones without manually typing them myself. It's no exaggeration to say that CalZones has dramatically simplified my work life since I started using it last month. By combining a time zone converter with a calendar, CalZones has managed to meaningfully improve how I schedule my typical work day with the remote MacStories and Relay FM teams. Thanks to CalZones, I no longer have to refer to Google searches, unpredictable Siri answers, or mental calculations to quickly understand what a specific time of the day corresponds to in three different locations around the world. 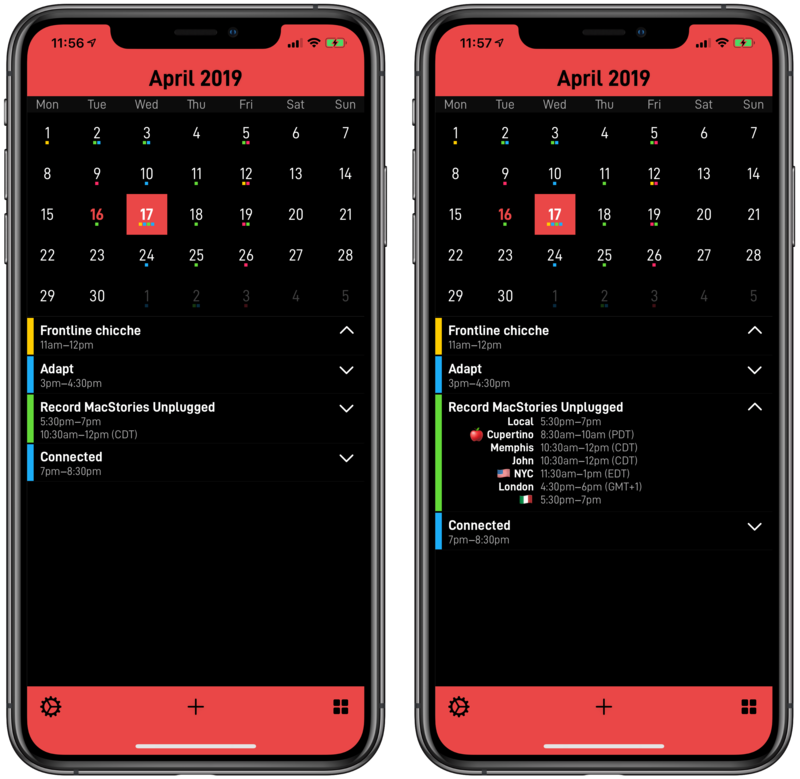 CalZones' blend of calendar events and time zones lays it all out in a functional, intuitive visualization that, as far as I know, has no equals on the App Store. For me, CalZones was instant home screen material, and it's become one of the apps I open most frequently every day. CalZones is a niche product. Unless you regularly schedule events or meetings with colleagues or clients across more than two time zones, you'll probably be better served by the hundreds of world clocks you can find on the App Store. 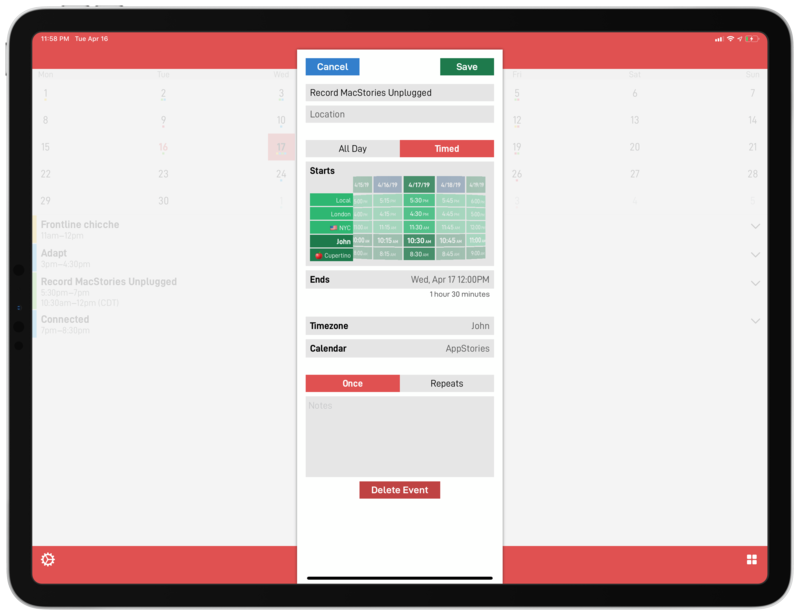 CalZones was designed to address the needs of a different kind of customer – the one who deals with a handful of time zone conversions on a daily basis and often has to participate in calendar events with attendees from other countries. "I feel like the amount of time I have spent doing date math over the last five years would add up to a non-trivial amount", Myke Hurley, co-founder of Relay FM, told me earlier this week. "Before CalZones, I would find myself using some kind of world clock, then correlating it with my calendar, going back and forth. CalZones makes such a logical link between these two things, it’s really just made the complexity around scheduling disappear for me", he concluded, and I agree. In the weeks I've been using it, CalZones has outright erased all the complexities involved with time zone calculations, turning a once-annoying chore into something I can now solve in a couple of seconds with an app. "I made CalZones because I got frustrated with how complicated working with time zones was within a traditional calendar app. My goal was to create a visual layout where coordinating events across multiple time zones was a native experience", Smith told me. Not only has Smith fully achieved his goal with CalZones, but he's also made one of the most useful, well thought-out iOS utilities I've tried in a long time. CalZones is available at $4.99 on the App Store.